In Lecture 2, we used spectral partitioning to rule out the existence of a strong parallel repetition theorem for unique games. In practice, spectral methods are a very successful heuristic for graph partitioning, and in the present lecture we’ll see how to analyze these partitioning algorithms for some common families of graphs. Lipton and Tarjan proved that every planar graph has a negligibly small set of nodes whose remval splits the graph into two roughly equal pieces. More specifically, every n-node planar graph can be partitioned into three disjoint sets such that there are no edges from to , the separator has at most nodes, and . This allows one to do all sorts of things, e.g. a simple divide-and-conquer algorithm gives a linear time -approximation for the maximum independent set problem in such graphs, for any . So there is a natural question of how well spectral methods do, for example, on planar graphs. Spielman and Teng showed that for bounded-degree planar graphs, a simple recursive spectral algorithm recovers a partition of the vertex set so that . In other words, for bounded-degree planar graphs, spectral methods recover the Lipton-Tarjan separator theorem! This is proved by combining Cheeger’s inequality with their main theorem. Theorem [Spielman-Teng]: Every n-node planar graph with maximum degree has , where is the second eigenvalue of the combinatorial Laplacian on . If we define the standard inner product , then one can easily check that for any such , we have . In particular, this implies that is a positive semi-definite operator. If we denote its eigenvalues by , then it is also easy to check that , with corresponding eigenfunction for every . note that this definition varies from the we defined in Lecture 2, because we will be discussing eigenfunctions without boundary conditions. Now one defines . Finally, we have the version of Cheeger’s inequality (proved by Alon and Milman in the discrete setting) for graphs without boundary. This follows fairly easy from the Dirichlet version of Cheeger’s inequality presented in Lecture 2. Here’s a sketch: Let satisfy , and suppose, without loss of generality, that has . Define for and otherwise. Then for , so we can plug into the Dirichlet version of Cheeger’s inequality with boundary conditions on . For the full analysis, see this note which essentially follows this approach. By examining the proof, note that one can find a subset with by a simple “sweep” algorithm: Arrange the vertices so that , and output the best of the cuts . So using the eigenvalue theorem of Spielman and Teng, along with Cheeger’s inequality, we can find a set with . While this cut has the right Cheeger constant, it is not necessarily balanced (i.e. could be very small). But one can apply this algorithm recursively, perhaps continually cutting small chunks off of the graph until a balanced cut is collected. Refer to the Spielman-Teng paper for details. A great open question is how one might use spectral information about to recover a balanced cut immediately, without the need for recursion. Now we focus on proving the bound for any planar graph . A natural analog is to look at what happens for the Laplace-Beltrami operator for a Riemannian metric on the 2-sphere. In fact, Hersch considered this problem almost 40 years ago and proved that , for any such Riemannian manifold . His approach was to first use the uniformization theorem to get a conformal mapping from onto , and then try to pull-back the standard second eigenfunctions on (which are just the three coordinate projections). Since the Dirichlet energy is conformally invariant in dimension 2, this almost works, except that the pulled-back map might not be orthogonal to the constant function. 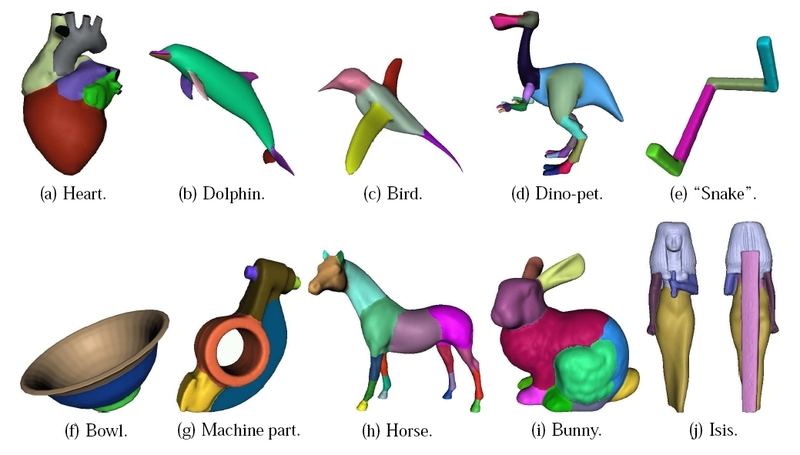 To fix this, he has to post-process the initial conformal mapping with an appropriate Möbius transformation. Unaware of Hersch’s work, Spielman and Teng derived eigenvalue bounds for planar graphs using the discrete analog of this approach: Circle packings replace conformal mappings, and one still has to show the existence of an appropriate post-processing Möbius transformation. where is the Euclidean norm on To see that this holds, note that the minimum will always be achieve for some coordinate projection , , or of , by the elementary inequality for any non-negative numbers and . So how do we get a geometric representation of our graph? A very natural representation comes from the circle packing theorem of Koebe (rediscovered later by Thurston, following from work of Andreev). Look here for a historical account, and the relationship with conformal mappings. Circle-packing theorem: For any planar graph , there exists a set of interior-disjoint circles in such that and are tangent if and only if . Dan Spielman’s notes contain a nice proof of the theorem using convex programming. Now, suppose we take such a circle packing, and compose it with a stereographic projection (which takes circles to circles) so that we get a circle-packing on the unit sphere. Let be the mapping which takes a vertex to the center of its circle on the unit sphere . If we are somehow lucky, and it happens that , then we could use , along with (1) to get an eigenvalue bound as follows. where is the surface area of . It follows that the numerator is at most , and therefore . Of course, this all depended on a statement of the following form, which would guarantee that we can take with . 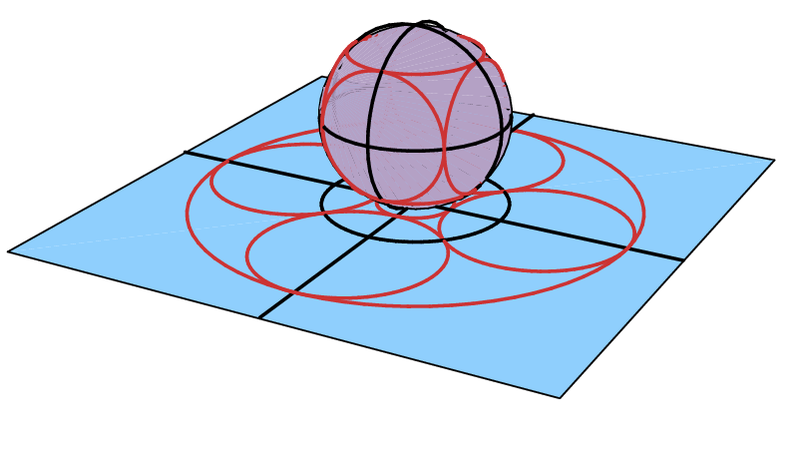 Given any collection of disjoint caps on the sphere, there exists a circle-preserving map such that in the image, the center of mass of the centers of the caps lies at the origin. In fact, we prove the following related, but slightly easier statement, and the interested reader can see Spielman and Teng for the full details. Transform lemma: Let be points on the unit sphere. Then there exists a circle-preserving map such that . This lemma doesn’t manage to prove quite what we need, since the centers of circles do not have to map to the centers of circles in the image, but it captures the essence. To prove the transform lemma, let’s first introduce some circle-preserving maps. 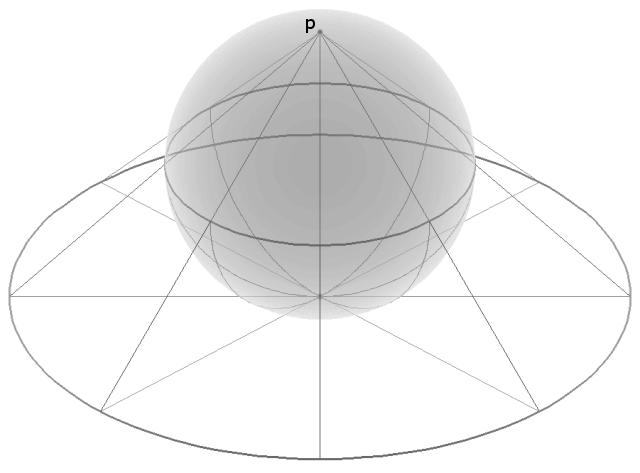 Let be the stereographic projection with as the pole. Furthermore, let be the scaling map , with . Finally, define . Observe that as , we have for all . In other words, this map pushes everything on the sphere toward . where is the open unit ball in . For , maps . Also, as approaches , we have for every . Define by . Now, as , we have and , as long as we do not have for any . But this can be handled by spreading the point mass at each out uniformly in a cap of radius . Let be the center of mass of all the -caps around each . Supposing we do this, we will have as . This implies that can be extended to a continuous function , and furthermore its restriction to is the identity. But now basic topology shows that there must exist an for which . Finally, take to conclude the existence of an with . 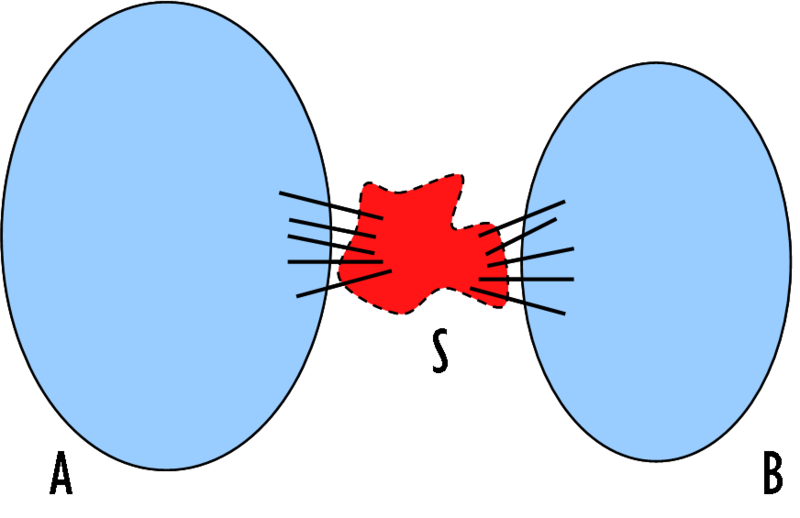 The basic topological fact we needed is the following. Lemma: If is a continuous map and is the identity, then there exists an with . Proof: Let be defined by . Note that is continuous. Now, suppose that 0 is not in the image of , and define a map from to itself by . By assumption, is continuous, however it has no fixed point, contradicting Brouwer’s theorem. Did I miss lecture 3? That would be the late Oded Schramm.